I’ve got a make-at-home version of one of my favorite restaurant dishes for you today. 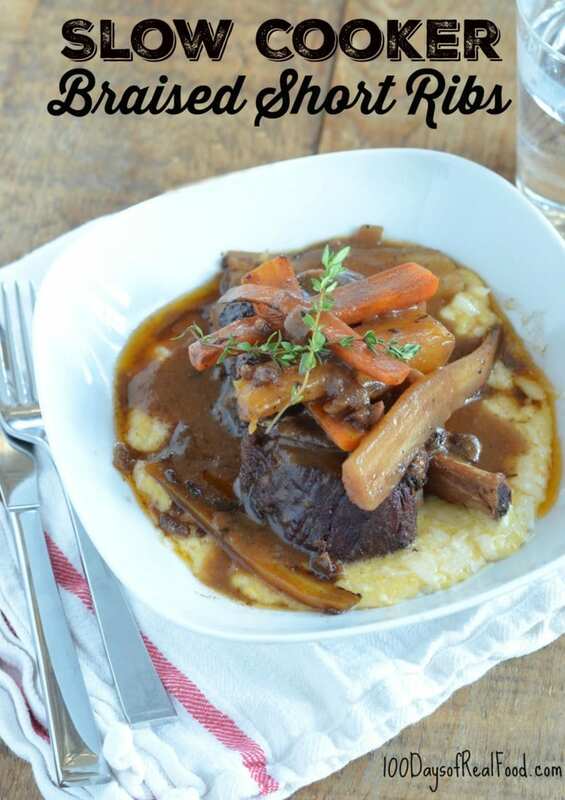 I guarantee if short ribs are on the menu, I am eyeing it! It’s hard to beat that falling-off-the-bone tender meat combined with delicious, cooked veggies and flavorful, rich gravy. The ultimate comfort food! 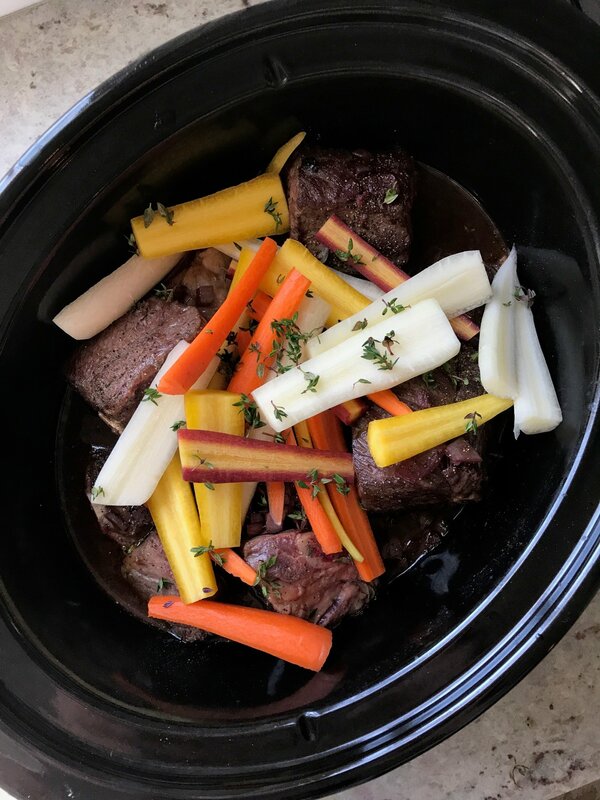 If you’ve never made braised short ribs at home before, this is a perfect first-timer’s way to try it. 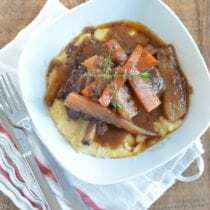 Hard to go wrong when you’re using your slow cooker! Plus, come the end of the day, it’s such a treat to have all the dinner prep behind you. Heat 1 tablespoon of the olive oil in a large skillet over medium-high heat. Season the short ribs with salt and pepper to taste. Brown the short ribs on all sides, in batches if necessary, 6 to 8 minutes total. Add to slow cooker. Turn the skillet down to medium heat and add another tablespoon of olive oil to the pan. Cook the onions while stirring until they begin to soften, 2 to 3 minutes. Add the garlic and tomato paste to the pan. Stir while mashing down the tomato paste for another minute (do not allow the garlic to burn). Carefully pour the red wine into the skillet and let it boil down for 4 to 5 minutes. Scrape into the slow cooker. Pour the broth/stock on top of the short ribs and sprinkle in the seasonings. Lay the carrots on top, cover and cook on high for 5 to 6 hours, until the meat is tender enough to fall off the bone. It's highly recommended to make a gravy out of the finished cooking juices (you can find my tried and true gravy recipe below). Serve over a quick and easy polenta, if desired, or mashed potatoes. Here’s my gravy recipe mentioned above, and a video to go along with it. It's easy to make delicious, homemade gravy. 1 cup juices, from the roasting pan, fat removed. You can also use chicken broth. Separate the cooking fat from the pan juices - a gravy/fat separator makes this job easy. Heat the cooking fat (or butter) over medium-low heat until melted. Carefully whisk in the flour to help avoid clumps. Cook until the mixture darkens in color, about 1 to 2 minutes. This step is called making a roux. Whisk in the pan juices (or broth) and bring to a light boil. Cook while whisking occasionally until the gravy reduces and thickens. Season with salt and pepper and serve warm over meat or potatoes. Ready to go in the slow cooker so you can have the evening off! I love your blog and your ideas for healthy lunchbox options. I have a question – when you pack stuff like pizza, or foods with cheese or meat, are they a food safety concern if they’re not refrigerated or kept warm for 4.5 hours before they eat? I do use a good thermos and preheat with hot water for soups, but don’t know what to do with hot dogs & items that don’t fit. Or am I paranoid? :) Thanks. Hi there. Lisa uses ice packs in lunch boxes to keep most foods cool. She uses the thermos for soups, oatmeal and such. We made this last night and it was delicious! Definitely going into the dinner recipe rotation!